What inspires horror director and industrial metallurgist Rob Zombie, do you think? Unexplained creaks in the night? The sweet thud of a pneumatic drill outside his window in the morning? Add to that list: Assassin’s Creed Unity. Ubisoft have commissioned a short film “inspired by” the new historical parkour simulator. The short begins with the date, July 28, 1794, and sticks admirably close to real history thereafter. 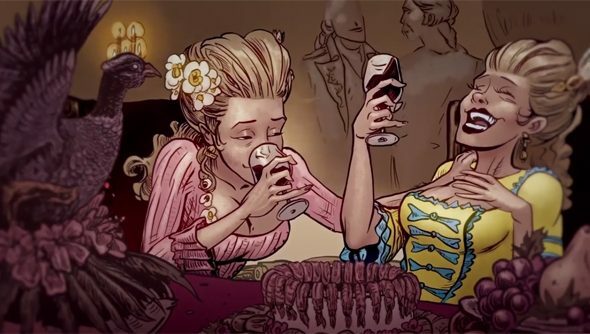 Zombie has “reimagined” the French Revolution as a squishy montage of blood and wine, and let The Walking Dead drawer Tony Moore animate it. While good prep for the game, it’s probably not indicative of Unity’s tone – Zombie’s unsurprisingly fixated by the guillotine. But it’s reassuring to see that Ubisoft intend not just to indulge in the rhetoric of freedom the series has always dealt in, but also to move beyond the revolution and cover the crimes committed in its name. The Assassin’s Creed Unity E3 trailer, for all its colour, had looked like a black-and-white view of the conflict. Have you seen Ubisoft’s reveal of Assassin’s Creed Unity’s open world yet? The districts of Paris sounds as varied as they are (inevitably) violent.